Forgot to mention the other day that I also made a German Chocolate Cake along with a tray of Chicken Paprikash for that staff Oktoberfest party I attended last weekend. I titled the post Killer because it really KILLS the competition. The taste and presentation is totally worth all the time, eggs and butter it requires. 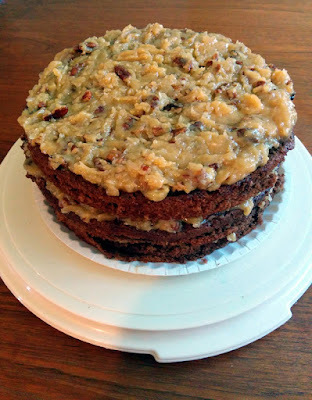 Did you know that German chocolate cake is really an American invention? Neither did I until after I volunteered to make it, being that the party had an Oktoberfest theme. When searching for the definitive recipe I found some interesting facts about the name. And its ingredients. Every few months, my co-workers get together at someone's house for a potluck dinner. We try to tie it to a theme just to make it easier when someone asks what to bring. Our most recent theme was Oktoberfest, so of course most people brought beer and/or pumpkin spice anything. I brought Chicken Paprikash. While most people think of Paprikash as Hungarian, I found enough sites that considered it German enough to go with the theme at hand. To make it easier for guests to enjoy without needing a knife or wearing too much of the sauce, I cut up the cooked chicken into one-bite pieces. If you plan to serve this dish to your family, make it easy on yourself and serve the thighs (or even drumsticks) intact, and allow one or two pieces per serving. There is plenty enough sauce to increase the number of pieces to 10 or 12. I don't recommend breast meat. The long cooking time tends to dry out white meat. Dark meat remains nice and tender.